Cape Town - The sudden replacement of Finance Minister Nhlanhla Nene is one of the worst events for an economy that has little to no 'cushioning', warned Citi Research on Friday. The ripple effects of the move for an economy that can ill afford such a knock are huge. Economist Gina Schoeman said Nene's replacement with largely unknown David van Rooyen affirmed Citi's baseline view for a sub-Investment Grade sovereign ratings downgrade in June 2016. Citi also expected the SA Reserve Bank's monetary policy committee to be more hawkish and tighter with monetary policy off the resultant inflation risk. "The downside GDP growth risks for 2016 and 2017 now look much stronger," Schoeman said. And with SA already officially on negative watch the next rating is likely to be junk unless action is taken to promote higher GDP growth, said Overberg Asset Management. Consumer confidence, a necessary ingredient for growth, hit an all-time low on Thursday ahead of the bumper season for retailers. The Bureau of Economic Research warned that the festive season sales could come under pressure as confidence tumbled to -14 index points in the fourth quarter from -5 in the previous quarter, signalling tough conditions ahead. "Decimated consumer expectations concerning the performance of the local economy over the next year are likely owing to government’s limited ability to boost economic growth," said MMI economist Sanisha Packirisamy. "A low growth environment capping revenue collections points to rising fiscal strain in an attempt to adhere to government’s expenditure ceiling. "Drought conditions and a sharp depreciation in the currency (pointing to rising inflationary pressures) are likely causing further damage to sentiment." The rand is at its weakest levels following Nene's axing, with the unit closing at record highs against major currencies on Thursday - R15.43/$, R23.36/£ and R16.87/€. 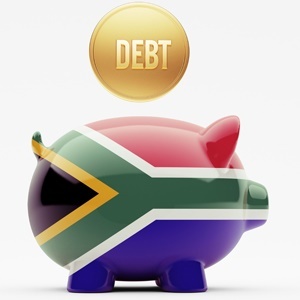 For the two-thirds of ZAR-based investors, it would be naïve to believe that local currency returns will remain resilient to a credit rating downgrade, said Schoeman. "I the event of a sub-IG status, sectors that should outperform are the direct ZAR hedges such as SA gold stocks and Sasol, as well as the dual-listed entities such as British American Tobacco, SAB, and Richmont. "The most vulnerable sectors however would be financials, retailers and local industrials," warned Schoeman.